Fake Tan Collection: What Does What? If you've read any of my fake tanning posts in the past, you'll know I'm a bit addicted to fake tan. 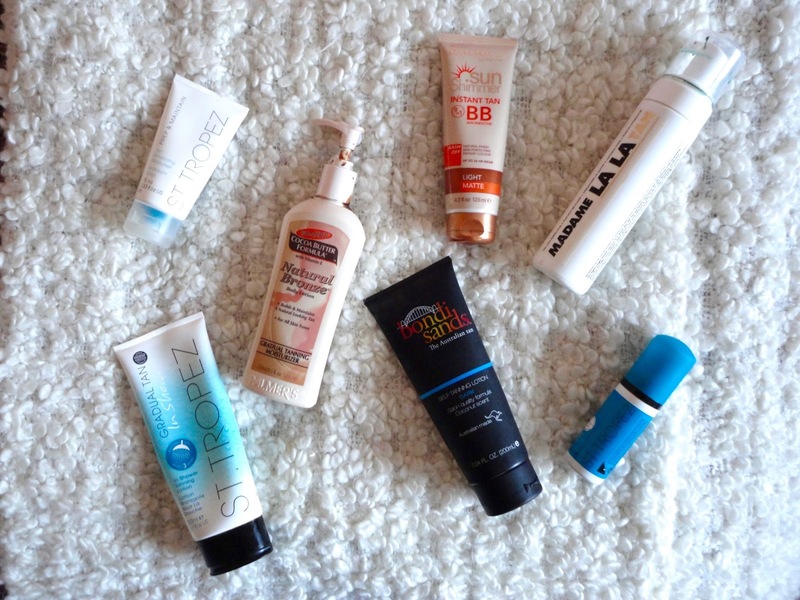 I used to have a collection larger than I'd like to admit, but after streamlining it I thought I'd share my collection and talk about what does what - if you're looking for a new fake tan this post is for you! The Gradual Tans - First up is the gradual tans. These are for anyone who just wants a quick and easy glow, maybe for a holiday or to top up an existing tan in summer. Firstly, I have the St Tropez In Shower Tan (£14.50). You can see my full review of this here. This is a nice, easy tanning lotion to apply in the shower, wait 3 minutes and rinse off. I particularly liked using this on holiday to even out my tan, but as you can imagine the colour payoff is extremely minimal. Rimmel have just come out with a very similar product, but I haven't seen the best reviews for it, so if you're looking for something you can apply in shower, I'd go for this. For a stronger result, try the Palmer's Natural Bronze Gradual Tan (£5.69). You definitely need a mitt to apply this as it does come out a very strong colour so you'll definitely see if you've missed any spots. I've not really given this a proper go yet, but I think this would be a nice one to keep a tan maintained if you like looking bronzed all the time. For other gradual tans not featured in the picture, I also like the Bondi Sands Gradual Tan (review here), and St Tropez Gradual Tan (review here). The Tanning Mousses/Lotions - For a stronger tan, I'd definitely recommend the usual tanning lotions and mousses out there. Generally, you apply them with a mitt, leave for 8 hours (preferably overnight), then wash off the guide colour to leave you with a lovely tan. I have three favourites in this category. First is the Madame La La Tan (£30). This is not cheap, but it definitely has it's reasons! It is enriched with lovely hydrating ingredients like Coco Water, Aloe Vera and Vitamins A & E. You can see my full review of this here. Secondly, the Bondi Sands Dark Tanning Lotion (£14.99) is a favourite. I do find lotions a bit trickier to apply than mousses as they take longer to blend out and dry on the body, but maybe a better choice for anyone with drier skin as it's less likely to stick to dry patches. Surprisingly, considering it is supposed to be Dark, this tan probably gives the least colour out of my three tans. You can see colour payoff in my full review here. Finally, my go-to tan is the St Tropez Express Tan (£33). I've gone through 2 bottles of this now, and am currently using a mini size I got for Christmas. You leave this tan on for up to 3 hours depending on how dark you want to be (I usually leave it for 3+ hours, or even overnight! ), wash off and you're left with a customised tan! You can see my full review of this here, but I think the facts speak for themselves - if I'm repurchasing a tan, it's got to be good! Instant Tan - I'm not a huge fan of instant tans, because I'd rather have a tan that lasted for a few days, and I don't particularly like how they transfer onto bedsheets, but if I do need a bit more colour, I like the Rimmel Instant Tan +BB Perfector in Light (£6.99). This has skin perfecting properties in it - kind of like a body BB Cream - which adds a nice colour to the body. The shade Light is more than dark enough for me, and I have used it on my face too with no issues. I actually haven't found this to transfer onto sheets too badly either so if I want an instant tan, I definitely go for this one! Hope you guys enjoyed that comprehensive post into my tanning recommendations and collection! What are your favourite tans? Let me know in the comments.